Protect your car, RV, boat, or anything else! 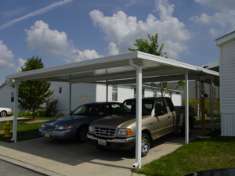 With unlimited options, Dacraft™'s customized carports will add instant beauty, value and functionality. 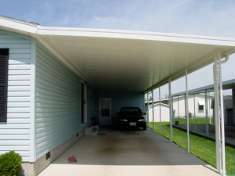 CLICK HERE to download our Carports Product Information pdf. Attached or Free-standing, Gabled and Flat-topped, our aluminum and steel Carports include a 6" easy-to-clean gutter system, with 3"x3" fluted, extruded aluminum posts that will protect your cars and add value to your Mobile Home. 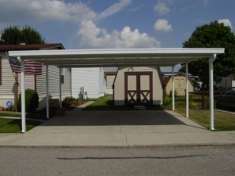 We design and manufacture our carports to your exact needs in our own factory, ensuring quality and accuracy.